Eight out of ten of us suffer occasional back pain according to the charity BackCare. If this pain is persistent or you have suffered trauma see a GP or physiotherapist. Otherwise here are a few ideas to help you avoid becoming a statistic. although problems may appear to strike out of the blue, they are usually the result of years of bad habits. Add on the insult of a society that is now governed by technology – we spend far too long sitting and staring at screens. Sign up for a class – Classes such as Pilates are available in many gyms and health centres and concentrate on strengthening the core muscles improving posture and flexibility. It may be advisable to get some one on one instruction from a physiotherapist trained in Clinical Pilates or Pilates instructor on the basics before you do a class. Sometimes, ‘less is more’ so make sure you start at a beginners level! Walk tall – imagine you have a thread pulling you up from the centre of your head and consciously relax your shoulders, keep your chest open. Remind yourself to keep your shoulders relaxed by mentally saying ‘Shoulders back and down’ when you are sitting in the car or standing in a queue. 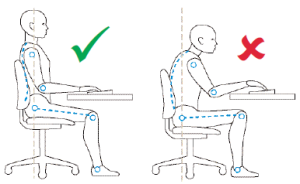 When sitting make sure your thighs and knees are level or below your hips. Your lower back should be well supported by the chair back If it isn’t, put a small firm cushion at the base of your spine. Your feet should be flat on the floor, your legs uncrossed. Being overweight or obese is one of the factors that can add to the burden of back pain. Subsequently, people who are overweight and experience back pain may want to lose weight to manage their back pain better – and this is not the only health advantage of losing weight. Experts now believe that inactivity is the number one cause of back pain. Taking balanced exercise – including aerobic, stretching and strength-training exercise – are some of the best ways to protect your back. If you are not used to exercising, gradually build more activity into your life. Aim to be more active, generally by getting off the bus a stop earlier, taking the stairs instead of the lift and leaving the car at home whenever possible. some hills, inclines and steps into your circuit. If your joints are up to it you may want to try jogging or running too. If you are into DIY or gardening, pace yourself. Prolonged bending can put a strain on your back and lead to problems, so don’t overdo it and vary the tasks. Repetitive high impact exercise such as running, step classes can sometimes aggravate low back pain. As can ‘over doing it’ in a gym environment with weights and mat exercises with out proper instruction. If you are suffering from persistent low back pain, don’t just keep going – seek medical advice from your GP or Physiotherapist. High heels can throw your body weight forwards which sometimes can be a factor with low back pain. It may be worth resting from wearing heels to see if your back settles. Flat feet can also lead to back pain, particularly if doing a lot of high impact exercise such as running. It is important to buy a running shoe that suits your foot shape. A good running shop should help you with this. Sometimes wearing a shoe insert (orthotic) can help if you are flat footed. These can be purchased from large pharmacies or you may benefit from a Podiatrist’s opinion if requiring a custom orthotic to be made. If you have weak back muscles, lifting heavy objects can put a strain on your spine. We all of us lose some muscle tone as we get older, so it’s especially important to lift properly. Try to avoid lifting heavy objects at all if you can. If you do have to pick up something heavy, pull in your lower tummy muscles and bend your legs so that the large muscles in your thighs and bottom take strain, rather than your back. Hold the object close to your body. The same applies if you have a small child; bend your knees and don’t be tempted to hold the child astride one hip as this puts a strain on your back. Chronic back pain is often the result of sore, tense muscles. A good night’s sleep is vital to relax the muscles and build up your energy to enable you to cope with pain. An old saggy mattress can do your back more harm than good, which is why it’s vital to choose one that supports your spine properly. If you wake with a backache in the morning it could be a sign that your mattress is not right for you. To check whether your mattress gives adequate support, lie on your back and slide your hand under the small of your back. If there is a large gap, your mattress is too hard. If it is hard to squeeze your hand in it is too soft. Your pillow is important too. You may be better off with one rather than two pillows which can place a strain on your neck. Shop around and try a few out to find the one most comfortable for you. Posted in Exercises, Injury, Posture, Stretches. "A brief note to register my thanks and appreciation for Mr Ben Lee whom I have now seen for 5 sessions of physiotherapy. I have felt distinct improvement in the condition he is treating me for and my walk is much improved, enabling me to walk significant distances again without pain. I recognise that he may not be able to fix the underlying problem which is an impacted nerve but he has certainly alleviated the huge discomfort, indeed pain, I have been experiencing and I am keen to continue under his care. I understand that spine, nerve and muscle problems are not fixed overnight! He has used acupuncture in my treatment and while this has been a first time for me, I am sure it has helped my progress significantly. I also appreciate the fact that he explains what he is doing and how the treatment he delivers is intended to have its effect. I am particularly grateful that he has been absolutely punctual in seeing me every time. Not an experience I have had in other settings, so I commend him for that."